I know, I know. I've put this off way too long. Like I said, I'm easily distracted! I need to make a to-do list! 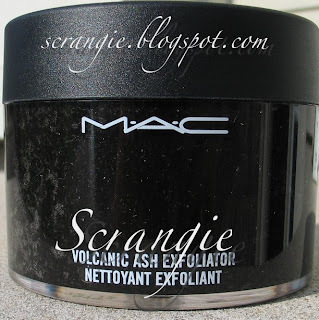 "A highly effective, dual-purpose, foaming and exfoliating scrub blending natural Volcanic Ash with fine sugar crystals from the islands of Vanuatu. Adds moisture: leaves skin feeling soft and comfortably clean. Mineral-rich. Good for absorbing skin’s natural oils. May be used on any part of face or body. Rinses off with warm water. " I'm not exactly sure where Vanuatu is (a quick google of it tells me that it's somewhere in the middle of the ocean to the west of Fiji...?) but it sounds exotic. Exotic. Maybe that's what is enticing about this product- it's made of the ash from a volcano on some tropical island... And you rub it all over your face! Yes, that's exactly what I want to do!! When you open the jar, you're presented with some wiggly black sludge. Lovely. Actually, I think it looks pretty freakin' awesome. The scent is kind of strange- like a mix between burnt sugar and weird, pungent men's cologne. Not gross, but not really good either. You can easily scoop the product from the jar- it's not too runny, though it's definitely not firm. It sort of reminds me of the texture of Cream of Wheat. Loose, grainy, not too drippy. When you apply it to your skin, it forms a small amount of lather. Lathering scrubs bother me- they lather all over and go up my nose and in my eyes an mouth... NOT FUN!! 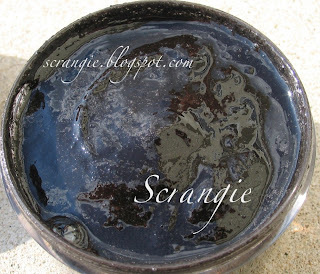 But this one only lathers a little bit- not enough to make bubbles but enough to lighten the dark black to a grey. It's really nice and scrubby. The sugar crystals give that satisfying scratchiness, and once they dissolve the ash gives a smooth feeling. It exfoliates quite well- leaves no flakes behind, but it doesn't dry your skin. It rinses clean, but you may want to use a bit of toner afterwards to make sure all the black is gone. After I rinse it off, my skin feels a little tight, but not dry. I like the sensation. It feels clean! It hasn't made me break out- very important! A lot of MAC skin products make me break out, but this doesn't. I love it. Overall, I really like this. The only thing I don't like is the scent. I like rubbing black sludge all over my face. Did you ever see those commercials where the guy has "engine gunk"? It's like that, BUT BETTER!! From your description, smell is somewhat similar to Ojon hair products smell. Marketing (exotic place, exotic ingredients, yada-yada) seems pretty much the same, too. Masa_inn, haha good for your wallet :D I used to HATE the smell of Ojon hair products, but now I kinda like it. Maybe it's an acquired taste, I think. I used to think it smelled like cigarettes and unwashed hippies, but now it smells like burnt chocolate and nuts to me! Ojon does nothing for my curly hair, so for me it still smells like dead cigarettes. I LOVE slopping black gunk on my face too! Have you ever tried the Kose Sekkisei whitening mask? It oozes out of the tube in black globs which you spread around your face. Once it's dried, you peel it right off and while that can hurt (I got used to it very quickly), I get a huge kick out of removing it whole. Removes a layer of gunk (dead skin cells, blackheads, peach fuzz) off your face, so your skin appears brighter. Shryh, that sounds AWESOME. I think I need it! I had a tiny sample of the Kose Sekkisei White scrub thing, which is also black and I loved it, but the sample was sooo tiny! I am using 1 container of it right now and I have 2 more from Nordstrom that I stocked up on. I never want to be with out it. It is supposed to be apart of the regular line in the fall.